Police in Northern Ireland used a stun gun on a man after he refused to drop scissors he had allegedly held to his uncle's throat, a court heard today. Armed response officers fired the stun gun at Paul Dunlop, 35, as he advanced towards them at a house on the outskirts of west Belfast on Saturday, a judge was told. Dunlop, of Firmount Drive in Antrim, is also accused of jumping on the bonnet of another relative's car and trying to get inside during the same incident. He appeared before Belfast Magistrates' Court charged with criminal damage to the Vauxhall Astra, three counts of common assault, and possessing an offensive weapon - namely a pair of scissors. Police went to Aspen Walk, Dunmurry amid claims Dunlop had been arguing with a sister and armed himself with a knife. 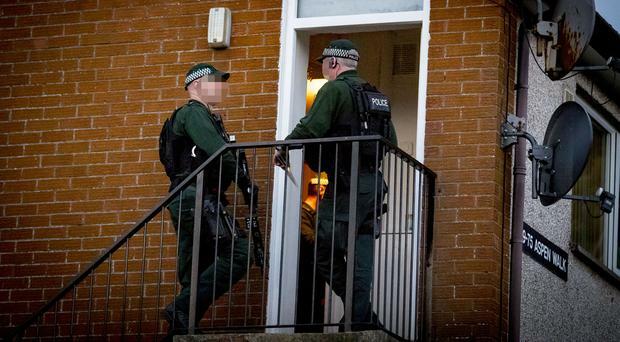 A PSNI constable said armed response officers entered the house with a ballistic shield and spotted the accused standing beside his uncle, apparently holding two knives. "Police gave clear instructions to drop the knives, but he wouldn't and walked towards them," she told the court. A stun gun was then deployed to bring Dunlop to the ground, with a pair of scissors recovered from the scene. It was claimed the weapon had been held to his uncle's throat, causing a cut to the neck. According to police he also acted aggressively towards his sisters and jumped onto the car, striking at windows in an attempt to gain entry to the vehicle. Dunlop was taken to the Royal Victoria Hospital after the stun gun was used against him. The Police Ombudsman has also been informed about the incident, it was confirmed. During interviews Dunlop denied putting any form of blade to his uncle's throat and claimed his memory was "hazy" due to being Tasered. His lawyer told the court: "I understand he is putting forward a self-defence case. "His injuries are visible... and the injured parties' accounts will need to be fully tested." Bail was refused due to the risk of interference with witnesses. District Judge Amanda Henderson said: "This allegedly involves the use of a weapon with injuries to the neck area, with a large police response to try and contain the situation. "It's too early in the day to consider bail." Dunlop was remanded in custody to appear again by video-link on June 25. An 18-strong work syndicate from Newry are having a "smashing’" time after winning a quarter of a million pound EuroMillions win. Ireland’s president has said those behind the killing of a journalist in Londonderry do not represent anybody on the island. Videos released by police appeared to show the moment a gunman fired the shots which killed journalist Lyra McKee. The latest winner of the Man Booker prize has paid a tearful tribute to a murdered Belfast journalist.